Sirmione is developed on a long, narrow peninsula, and it’s also an island, because it was isolated from a waterway ditch, on the enchanting Garda lake. The old town has a medieval aspect, with narrow and irregular streets, and many buildings made up of bricks and stones. Furthermore, you should visit the beautiful castle, the Catullo’s Caves, which was a great Roman villa, set in a natural environment of great beauty, the St. Peter’s church, in the highest part of the peninsula, or the church of Santa Maria Maggiore, in the centre of the country. The walks along the lake and the surrounding areas of Sirmione are also interesting, such as Brescia, Mantua and Verona, or Desenzano and Salò, which can be reached by boat. Sirmione is a health resort, a tourist center, but also the cradle of ancient civilizations, a land which was loved and inhabited by people who left in this place important signs which can be noticed and found walking in the streets of the historical centre. In this strip of land, which is unique and suggestive, you can stay at the Grand Hotel Terme, which is characterized by an exclusive and elegant atmosphere, with a luxury spa and an outdoor swimmingpool. 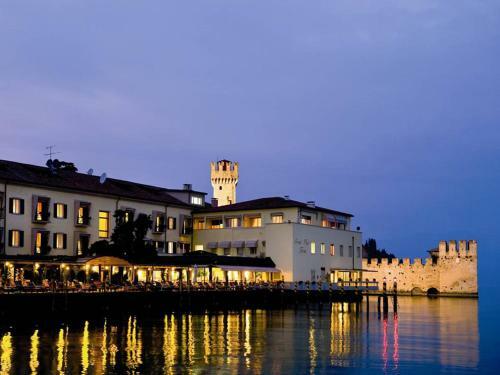 The hotel overlooks one of the most attractive and evocative views of Sirmione, and it offers its guests the best comforts and a great attention to details. This entry was posted in Design and SPA Hotels, Italy and tagged grand hotel terme, holidays sirmione, hotels brescia, hotels desenzano, hotels di lusso, hotels lago di garda, hotels mantova, hotels sirmione, hotels verona, luxury hotels, vacanze sirmione. Bookmark the permalink.